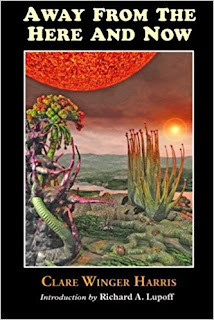 A Small Gang of Authors: Women in Science Fiction – Clare Winger Harris: Ruth de Jauregui While most women writers in early science fiction used their initials or a pen name, Clare Winger Harris (1891-1968) wa...Another great woman in Science Fiction with Ruth de Jauregui. Harris' second story "The Fate of the Poseidonia" placed third in a contest for Amazing Stories. 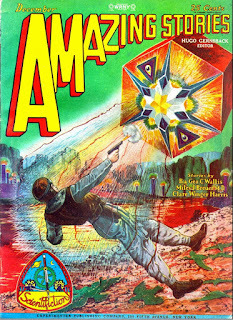 Editor Hugo Gernsback wrote in his introduction of the story in the June 1927 issue of the pulp magazine, "That the third prize winner should prove to be a woman was one of the surprises of the contest, for, as a rule, women do not make good scientification writers, because their education and general tendencies on scientific matters are usually limited. But the exception, as usual, proves the rule, the exception in this case being extraordinarily impressive. The story has a great deal of charm, chiefly because it is not overburdened with science, but whatever science is contained therein is not only quite palatable, but highly desirable, due to its plausibility. Not only this, but you will find that the author is a facile writer who keeps your interest unto the last line. We hope to see more of Mrs. Harris's scientification in Amazing Stories." Sadly, her byline was not on the cover. She may have been influenced by her father's writing, though it may have been a shared interest in science fiction that led to his own novel. 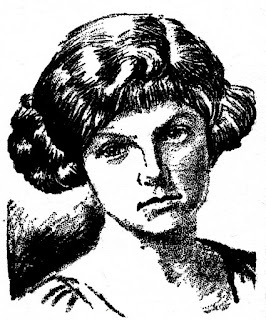 Her father, Frank Stover Winger, the son of the Stover Manufacturing Company founder, published his only novel The Wizard of the Island, or The Vindication of Prof. Waldinger in 1917. It was described as a "Jules Vernian story of super-science set in the South Seas." Harris' short career produced 11 short stories, mainly published in Amazing Stories, and one historical fiction, the novel Persephone of Eleusis: A Romance of Ancient Greece (1923). She put down her pen in the 1930s, reportedly to raise her three sons, after writing four letters for the pulps. Her final letter, published in Wonder Stories in August 1931, classified some of the predominant themes of science fiction. Harris' stories were collected into one volume, Away from the Here and Now (1947), and have been reprinted in a number of anthologies. 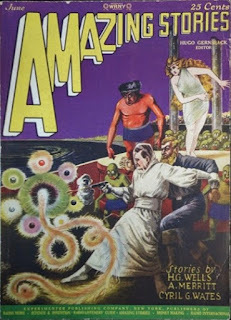 In addition to being the first woman to publish under her own name in the pulps, she was one of the first authors to write female main characters and from a woman's point of view. Among her stories were those focused on cyborgs and ape-people as well as strong female characters. It's great to learn about authors who wrote their stories before I was even born. It's great to learn about authors who wrote their stories before I was even born. Thank you Ruth! #OurAuthorGang . . . Ruth de Jauregui​ gives us another interesting article on women in science fiction. How inspiring Ruth to read about a woman writing great fiction before anyone thought it possible. Thanks for another great post. 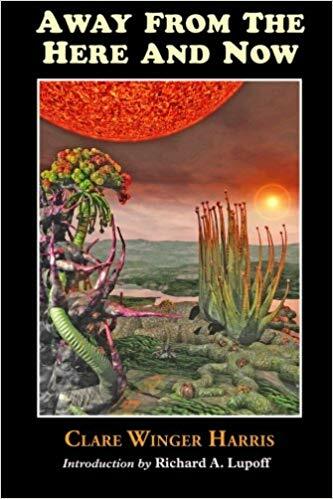 Ruth DeJauregui share another inspiring female science fiction author today on #OurAuthorGang Read about Clare Winger-Harris, a trail blazer in the sci-fi world. Clare Winger-Harris, a sci-fi author. She was first published in 1926 and proved that women could write as well as their male counterparts. Thank you, Clare. Today we learn about another female sci-fi author. Claire had a grasp of scientification long before others, and she used this information a way that not only pushed her forward into the spotlight but all women became more than just a pretty face. Nice and interesting. Another one for girl power. Great post. Another great woman in Science Fiction with Ruth de Jauregui. My contribution to our blog today. Stop by and check out Clare Winger Harris, an early science fiction writer who didn't use a pen name. Here's to women who aren't afraid to prove them wrong! I love learning about these women in literature. A great informative post. Another great and educational post. I'm learning so much more about a genre I already love. Great Post. I really enjoy finding out about these amazing women writers, Ruth.